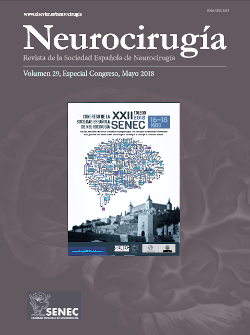 Neurocirugía (Neurosurgery is the official Journal of the Spanish Society of Neurosurgery (Sociedad Española de Neurocirugía) (SENEC) It is published every 2 months (6 issues per year). Neurocirugía will consider for publication, original clinical and experimental scientific works associated with neurosurgery and other related neurological sciences, as well as articles requested from experts, consensus documents and clinical guidelines, clinical cases, opinion articles, and any other information of interest for neurosurgeons. The Journal is published in two versions (Spanish and English). Neurocirugía is indexed in Research Alert Institute, C.A.B., Excerpta Medica, JCR, Index Medicus/Medline, and IBECS. The Editorial Committee is appointed independently of the governing bodies of the Society. All manuscripts are submitted for review by experts in the field (peer review), separate from the Journal Editorial Committee, and are carried out anonymously (double blind). Originals. Empirical studies associated with any aspect of research in the field of Neurosurgery that is in the form of a scientific article, with the following sections: abstract, introduction, Material and methods, Results, and Discussion. The length of the text will be 3,000 words. Besides, it will be included a structured abstract (Spanish and English), 4-6 key words and 30-40 literature references. Besides the text, until 8 Figures or Tables will be accepted. It is recommended that the number of authors does not exceed 6. Reviews. These types of manuscripts will be specifically commissioned by the Editorial Committee. Authors who wish to collaborate spontaneously in this section should previously consult the Journal Editors. These will be review on relevant and current topics in Neurosurgery with the following structure: Abstract, Introduction, Development and Conclusions. The maximum length of text will be 3,000 words. Besides that an unstructured abstract (in Spanish and in English) of 150 words will be included, as well as the corresponding 4-6 key words, and up to a maximum of 50 literature references will also be included. Besides the text, up to 4 Figures or Tables will be accepted. It is advisable that the number of signing authors does not exceed 3. Clinical cases. Cases that make an important contribution to the knowledge of the pathophysiology, aetiology or other aspects of a clinical process. The structure of these articles will be the same as Originals (Introduction, Clinical Case or Cases), Discussion, and Conclusion. The maximum length of the text will be 1,500 words. Besides an unstructured abstract of 150 words will be included and a maximum of 15 literature references. It may include up to a maximum of 3 Tables and/or Figures. The recommended number of authors is 4. Opinion articles. This section has as its purpose to publish relevant and current topics in Neurosurgery that contain novel aspects for the specialty. The text does not need to be formally structured, but should maintain the narrative logic (introduction, development of the experience and conclusions). The maximum length of text will be 2,000 words. Besides it will include an unstructured resumen/abstract (in Spanish and in English) of 150 words plus the 4-6 corresponding key words. Up to a maximum of 15 literature references will also be included. Besides the text, up to 2 Figures or Tables will be accepted. Letters to the Editor. These will refer to works published in the Journal and will contribute opinions, observations or experiences which due to their characteristics may be summarized in a short text. The maximum length will be 1,000 words of text, with no abstract, including a maximum of 5 literature references. The maximum number of authors will be 4. One Figure or Table will be accepted. Editorials. Opinion articles written by the request of the Editorial Committee. They must not be longer than 1,000 words and with up to 8 literature references. Its subject should be related with original articles published in the Journal, or on topics of general interest. It will include a maximum of 10 literature references. It will not contain any Figures or Tables, except in special cases where they are essential to improve the understanding of the text. Other sections. The Journal includes other sections (including Editorials and Special Articles), which are commissioned by the Editorial Committee. Authors who wish to collaborate spontaneously in any of these sections should previously consult the Editors associated with the Journal.